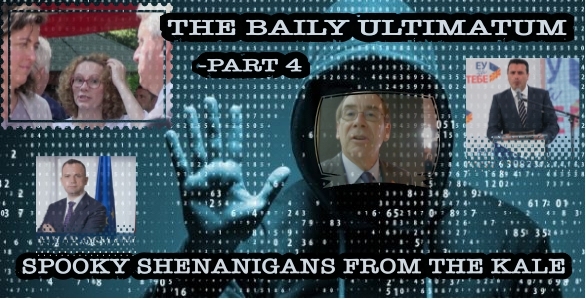 THE BAILY ULTIMATUM PART 4- SPOOKY SHENANIGANS – Alternate Comms. Did any US Embassy officials counsel Zoran Zaev in his approach to phrasing the words of the paper he signed to win the mandate from President Ivanov? If so, what did they do? The truth is that the Americans have constantly mentored the SDSM leader – a former mayor from the provincial town of Strumica – as they sought to make him fit for the role of international statesman. This process has included increasingly frequent trips to foreign capitals, and a noticeable improvement in his English-language skills over the past three years. 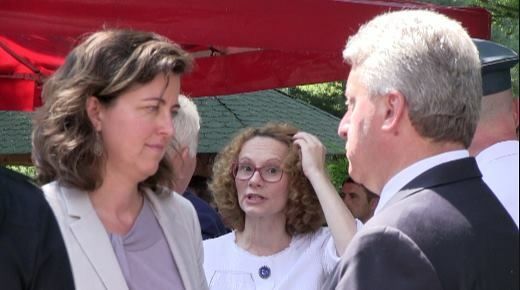 However, lurking closely behind the scenes is the Defence Minister, Radmila Sekerinska, who is popularly understood to be the real brains behind the government. This American pet was isolated in an Embassy diplomatic cable over a decade ago as one of the top five most powerful women in Macedonia. After the referendum, she is expected by many pundits to take on an important international job, perhaps in the United Nations or elsewhere in relation to EU structures as a reward for helping Macedonia change its name. None of that would be possible, of course, without a Zaev government and that brings the strange story of The Baily Ultimatum full circle, back to the summer of 2016. Following the 27 April 2017 storming of parliament put an end to three months of protests against the Tirana Platform, foreign officials put overpowering pressure on Macedonian leaders – particularly, President George Ivanov – to grant Zaev a mandate to form a government. However, the president would not do so unless Zaev dropped the racist and chauvinistic Tirana Platform backed by his crew of ethnic Albanian parties, that discriminated against Macedonian and all other ethnic populations in Macedonia and contradicted former U.S. policy as well. There was considerable scepticism that Ivanov would back down, with some media speculating that he would declare martial law rather than give Zaev a mandate. In the end, they were wrong, as the president finally caved in to the pressure. However, he required a written guarantee that the new coalition would uphold the constitutional order because the Tirana Agreement violated it on constitutional grounds. That’s where the US Embassy came in. According to several informed sources, US Embassy Deputy Chief of Mission Micaela Schweitzer-Bluhm–pictured above with President Ivanov and who is more than just a US State Department diplomat–and now-resigned US Embassy political officer David Stephenson played key roles in shepherding Zaev through the process of going through drafts of the memo. TEAM UZUNOV has published here, possibly the first time, the actual agreement as would be signed by Zaev. With the referendum coming up soon, it is shocking evidence that he has violated his mandate to form a government in almost every way. A careful reading of the document shows precisely why the government’s negotiated position with Greece, its referendum, actions against the media and some economic decisions are exactly counter to the agreement. However, to this day the president has not said a word about the violations and it is likely that he, along with VMRO-DPMNE politicians and others, are under tremendous pressure to toe the American line. The recent talk of possible border changes between Serbia and Kosovo – which would inevitably result in talk of the same for Macedonia – is being held like a sword over leaders’ heads by the US and EU. More specifically, the source told TEAM UZUNOV, the key activity was done by Dr. Amanda Sloat, Robert Bosch Senior Fellow at the Center for the U.S. and Europe at the influential American thinktank. 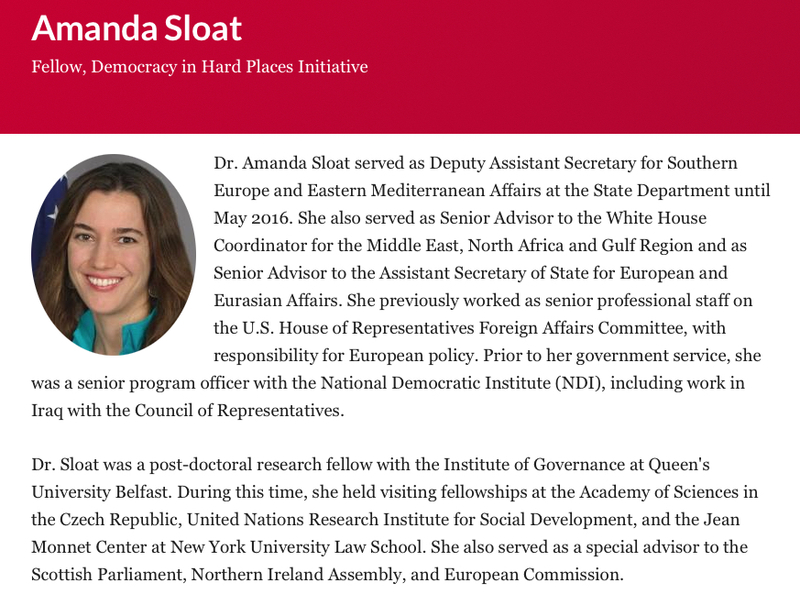 Like many of the others lurking in any around Macedonia during its three-year political crisis, Sloat has ties to the former Obama Administration: she was the deputy assistant secretary for Southern Europe and Eastern Mediterranean Affairs at the State Department, where she was responsible for U.S. relations with Cyprus, Greece, and Turkey as well as for coordinating European engagement on Middle East issues. 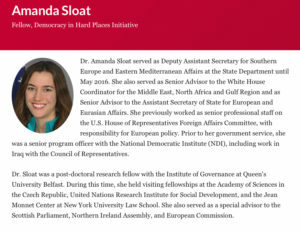 Previously she worked on other issues, like Britain, Scotland Northern Ireland, but by working on Turkey, the Middle East, North Africa and Turkey throughout the entire Obama Administration, Sloat would have worked closely with Jess Baily, who came to Macedonia after serving for several years as Deputy Chief of Mission in Ankara. Considering his behavior in Macedonia, it’s no surprise to know that Baily was also considered as controversial by the Turkish government during his time there. The kicker in all this, coming back to the fast-approaching referendum, is that the supposedly apolitical USAID funding managed through Ambassador Baily’s State Department and Embassy cronies, is still being clearly used for political purposes- that is, supporting a ‘yes’ vote on the referendum in favour of a Prespa Agreement that the Macedonians and Greeks didn’t even write! TEAM UZUNOV here reproduces a document from the CEPS program, that reveals the official request for applicants for four ‘Rapid Response Grants’ with an application date of 31 July, 2018. This indicates that the USAID’s ‘flagship program’ had been strategically picked for siphoning off votes in favor of the referendum – possibly, even before the Prespa Agreement was formally signed in Greece on 17 June. According to the USAID document, the four grants would be of $7,500 US Dollars each, and would be used “to support the initiatives that focus on the upcoming referendum.” Further, the USAID document states that referendum-education focus of grant winners should be “youth, women, minorities, the disabled and those outside the capital.” The project applicants are suggested to apply for grants with projects of between 3-6 months. 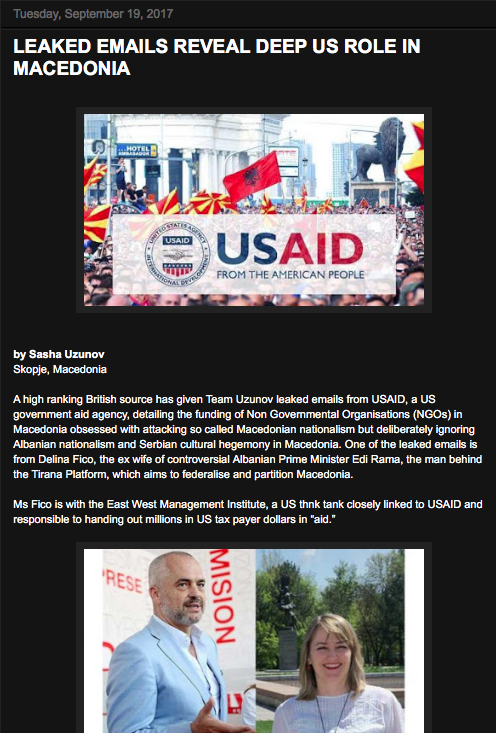 Hypothetically, this would have to mean that USAID was already expecting to do not only pre- but also post-referendum brainwashing on the Macedonian population, after 30 September. 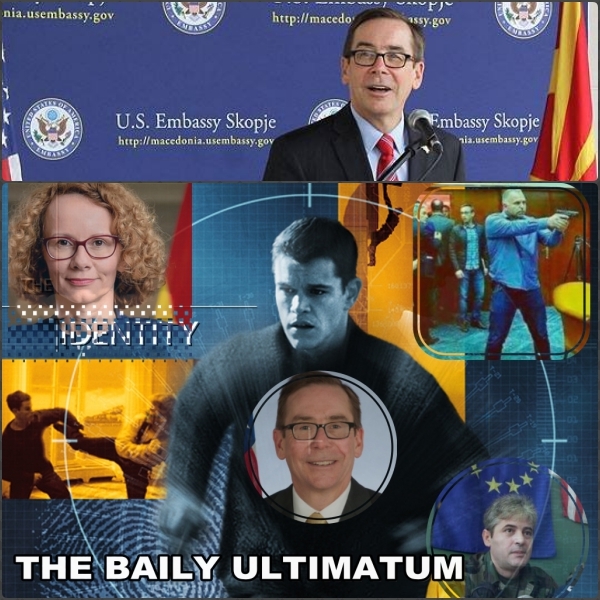 In the end, by using his Washington connections and some ‘heavy lifting’ by the likes of USAID’s “secret operations unit’ the Office of Transition Initiative (OTI), Ambassador Jess Baily was able to get out of trouble in 2017- and stick around to see his ultimatum to Macedonia finally fulfilled with the referendum on the Prespa Agreement on 30 September 2018, which will change the country’s name to satisfy the nationalist appetites of US allies – Macedonia’s neighbours and long standing negators – Greece, Bulgaria and Albanian at Macedonia’s expense. It’s the old taking the path of least resistance. That’s what it all comes down to. Easier to Washington to sacrifice Macedonia than have to deal with a hostile Greece, Bulgaria and Albanian political factor – US clients nonetheless. The name of the game is to get Macedonia into NATO and the EU to deny the Russians any opening in the Balkans. But that premise is faulty to begin with. Macedonia since its independence in 1991 from Yugoslavia has been under US’s patronage. The 2001 ethnic Albanian war in Macedonia and the 2003 Khaled El Masri rendition scandal, just to name two of many examples, hammers home the US’s vice like control of events in Macedonia. The new moniker Republic of North Macedonia and erasing Macedonian identity, if it comes to pass, will be the legacy of the Baily Ultimatum ! Canadian Macedonia pundit Mark Branov’s 2017 analysis about where powers really rests in Macedonia has turned out to be correct and highly applicable even to events relating to the controversial 2018 name change referendum.